My first interaction with Shake Shack was at the 2009 Burger Bash at the South Beach Wine & Food Festival. Shack fever was in full bloom in New York and I was ecstatic that I would be able to try their signature burger in South Florida. And then I had it and thought, what’s the fuss all about? I didn’t get it. The following year at the 2010 Burger Bash they were back plus they were also 6 months away from opening this location (South Beach). But this time when I tried it, it was different. I immediately got back in line and got a second Shack Burger…..
Kids……And that’s the story of my love affair with the Shack Burger. Not originally on the menu, they debuted the Smoke Shack Burger in February of 2012: American Cheese, Applewood Smoked Bacon, Cherry Pepper Relish & Shack Sauce. For first timers, I suggest you try out the Single Shack Burger, Fries and the Key Lime Pie oh My Concrete. It’s a good solid introduction to what they do best. I prefer their Fresh Squeezed Lemonade over a soft drink and if you’re going to go the Hot Dog route, check out the Frisky Dog (with Kraut and Tomato Simmered Onions). Some folks love Shack Shack and some don’t find anything special about it. To the latter, I say, “Better for me!” There will be fewer people in line when I’m getting my food. Not great. It was ok but that's it. The only reason there are so many people lined up is not because the burger is any good. It's because they don't want what the other places on Lincoln Road serve. Fancy Euro style stuff like Steak Tar Tar and other dishes your average tourist does not want. Unless they're from Europe. The burger and the drink were small too. The line was not. I thought the burger was good, not outstanding, but good. However, like the comment above… yes, the portions were indeed small. I want to struggle with my speciality burger. I want it to spill over, slip from my hands, mess up my shirt. At Shake Shack I was done in 4-5 bites. No mess, no stress. No gastronomical fun. Like BB, I was waiting with baited breath…OK, maybe not that bad…for SS to open in SB. I went, I ate, it was good, but I realized that I did it wrong, even though I am glad I followed BB’s advice to get a single, fries, etc. Next time–they are coming to Boca next year, so I will have to go to SB again, but will at xmas as my daughter is home from college and loves Lincoln Rd–I will get a double and fries. My friends live next to Lincoln Road and got a free frozen custard when we went–residents of SB only. I got a MINI taste–some “friends” they turned out to be!–and will probably get that if I have room after a double. I will also get the lemonade as I LOVE lemon (or lime) ade. I am very traditional–no cheese (doctor’s orders, but I never usualy get it anyway on a first-class burger–lettuce, tomato, onion, no catsup, a bit of mustard and a pickle if they have them. 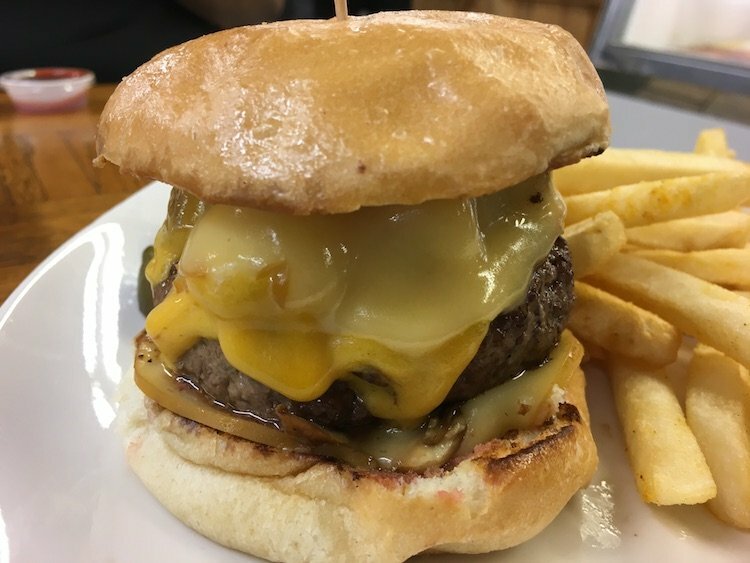 I am one who likes the taste of the beef, which is why at Charm City I get a Good Ol’ with no cheese and regular fries–my fav in SF so far after 40 years of trying burgers here. Next on my list is a Frita from “The King.” I know, after so long here I should have tried one by now, but I just don’t get down there that often. Still haven’t made my way to SS. With the news that Umami is going to make it’s FL debut in South Beach this Spring only blocks away, I’ll probably still be passing it up. I live by this website. We have declared Sunday as new burger day, and like little hobbits we leave works screaming “im going on an adventure” well this sunday’s adventure fizzled. i dont get shake shack at all. Overpriced long lines, shabby patty, hot dog nothing special. I wanted to love this place, i rank it below burger fi, somewhere in fiveguy land. Its ok, but really whats the fuss? Sorry to hear that. I love Shake Shack but some folks don’t. Thanks for your comments. Burgers Opinions always welcome. I am with my sunday burger lunch mates, and you remain our hero.